During the years that Norman Rockwell and his family made their home in Arlington, Vermont, the artist painted some of his greatest works, including "The Four Freedoms" and "Saying Grace." Compared to his former home in the suburbs of New York City, rural Arlington was "like living in another world," and it completely transformed his already successful career as America's leading illustrator. For the first time he began to paint pictures that "grew out of the everyday life of my neighbors," storytelling pictures that touched millions of people around the world. 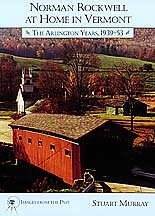 Historical photographs of Rockwell, his wife and children, and the town they made their home, Rockwell paintings and sketches, and the personal recollections of some of the artist's neighbors and models, help the reader imagine life in this small town, and the significance of Rockwell's time there. A regional map, selected bibliography, and listing of area museums and exhibitions suggest paths for further exploration. ABOUT THE AUTHOR: The author, Stuart Murray, born in Scotland and raised in New Jersey, majored in history at Rutgers University, and now lives in New York's mid-Hudson Valley. Murray is the author of 24 books - 12 works of fiction and 12 nonfiction. Ordering Information: 7" x 10"; 96 pages; Rockwell paintings and sketches and 32 historical photographs in black and white; Index.